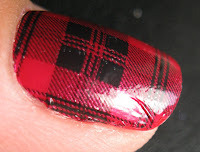 Sally Hansen Nail Strips Plaidical: A lengthy review - Polish Etc. 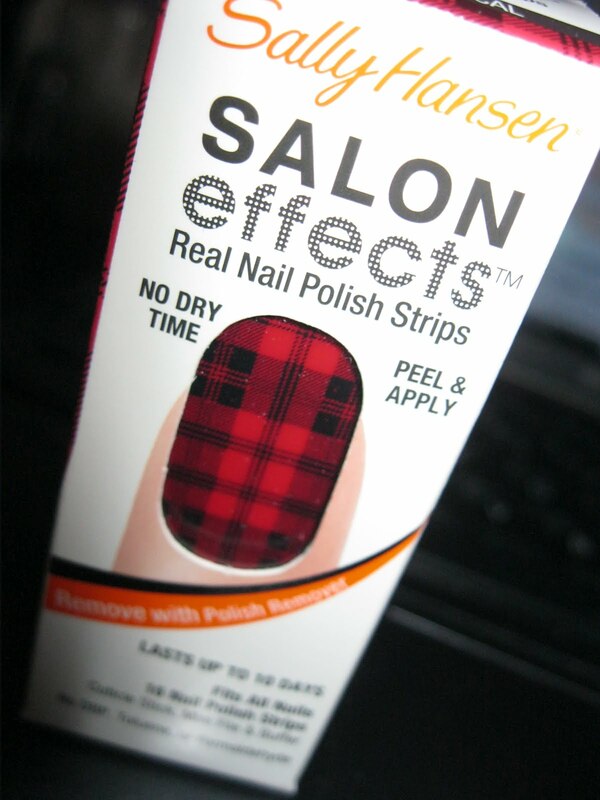 Sally Hansen Salon effects Nail Polish Strips Plaidical are a dark metallic red with black plaid pattern. 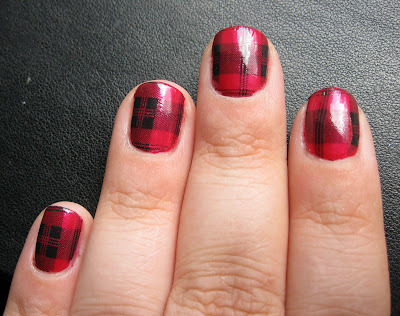 I have resisted buying strips for a long time, mostly because I didn't notice any pattern I absolutely had to have, but red, black, plaid? Gorgeous, so I gave them a try. I wanted to get the most out of my money and I managed to do a full manicure using just half the box! It was a definite learning experience. Read more after the jump! So I'm cheep. 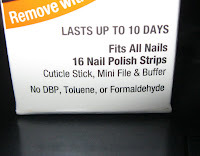 I read the box and first notice "16 nail polish strips" hmm.... That's only 4 strips short of being able to do two manicures with just one box. Inside the box there are instructions, a cuticle stick, small nail file, and two packages of the polish strips each with 8 strips of varying sizes. I opened one package for starters, and there was a good variety of sizes and shapes. I have very wide nails and several of the strips fit my thumb nail nicely although the smallest of the strips was only about half the width of my pinky finger (yikes!). 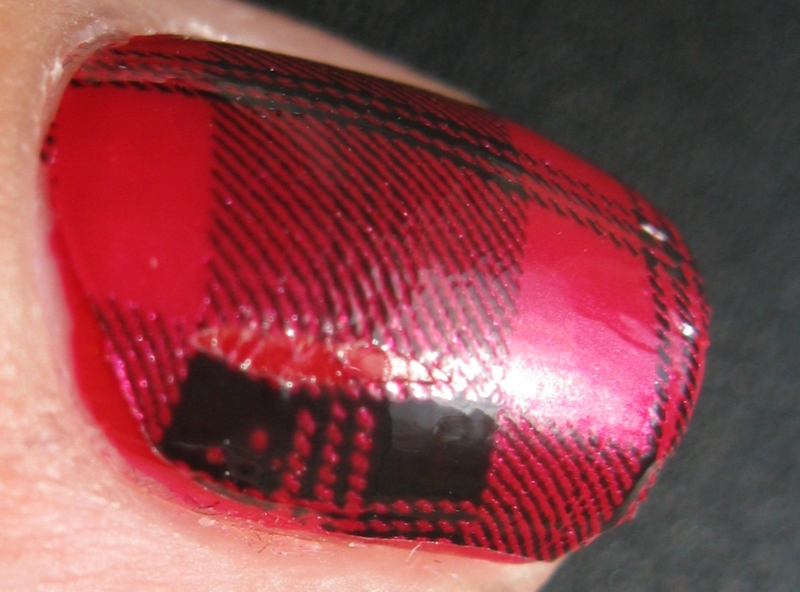 My nails were already painted red with Zoya Carmen, which coordinated well with the strips so I left it on. 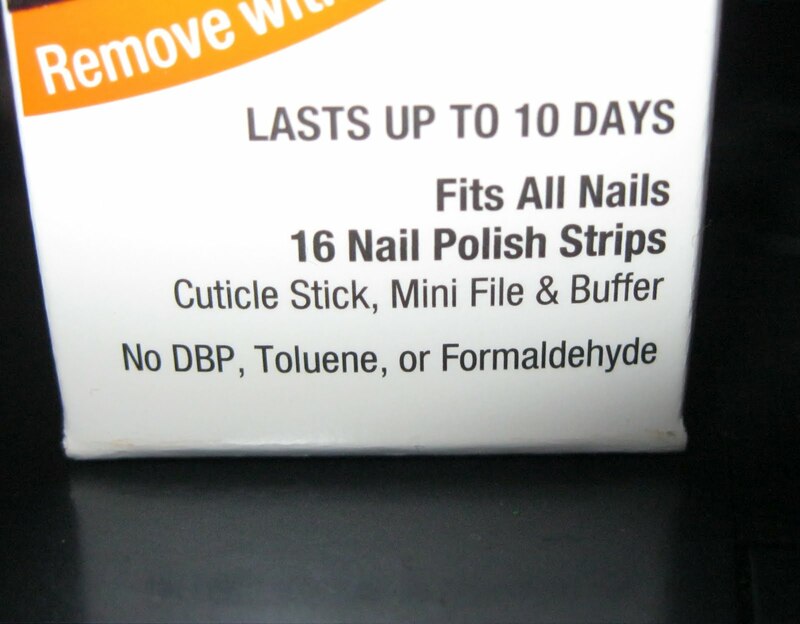 The SH instructions recommend wiping your nails with acetone before using the strips, but I ignored this. I'm not the most patient person so I figured if I missed a spot, red was better than nothing. I also never wear a mani for more than two or three days so I'm not worried about making it last. Each strip has a clear plastic layer on top of the polish strip, and white backing on the sticky side. 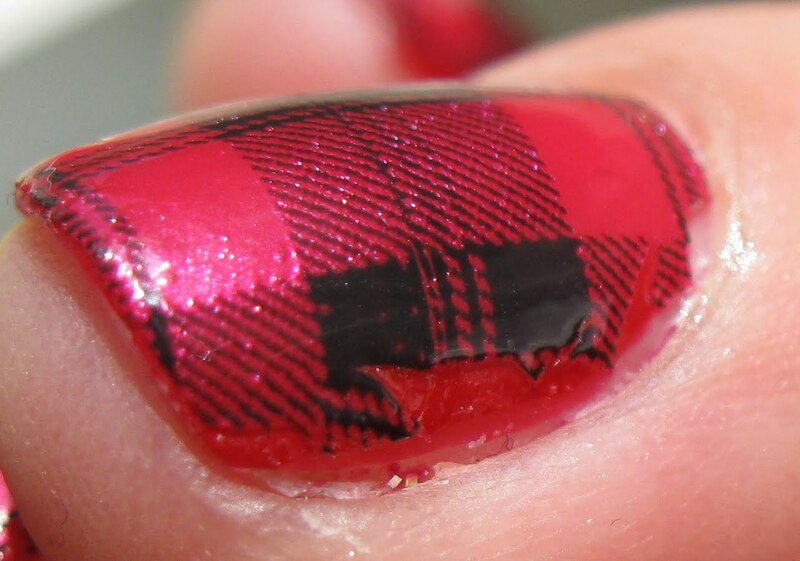 First you remove the clear layer, peel the strip off the backing, and stick it to your nail, sounds easy right? 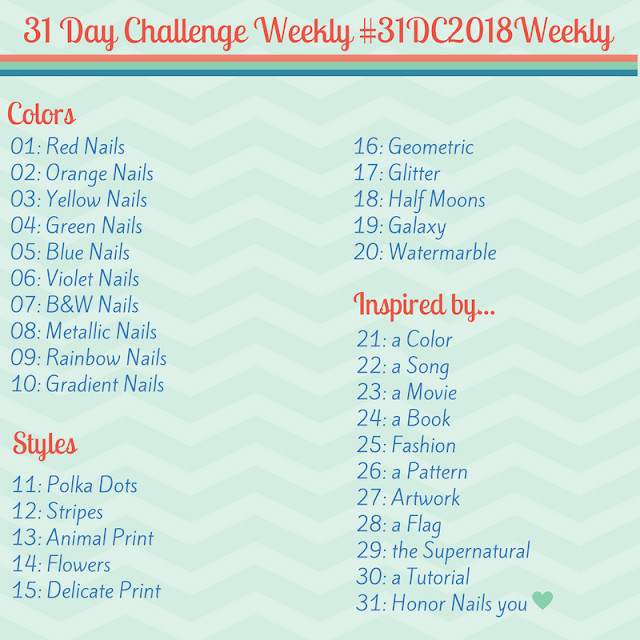 I started with my ring finger, finding a strip that seemed about the right size, when I stuck it to my nail I realized just how sticky the strips are, it seemed unlikely that I'd be able to re-position the strip if I got it crooked. Luckily, my first strip was straight and fit nicely on the nail, although I didn't stretch it or anything so the sides of my nail aren't actually covered with the strip and the tip really wanted to wrinkle. From there I used fingernail clippers to cut the strip about 3mm from the end of my nail. I carefully stuck the remaining length of the strip back on the backing with the hopes of using it on another nail. Both sides of the strip have slightly different shapes so that you can select whichever one fits the shape of your nail beds, so, chances are, if you use one side on your index finger you might have to use the other half on your ring finger. This was the case for my nails. Using these strips really makes you realize how differently each of my nails is shaped. I used the other side of the strip on my right index finger and it worked perfectly. For my middle finger I picked a rather wide strip that looked about the right size... wrong. I ended up having to use the fingernail clippers to cut the strip around the sides of my nails, and it ended up a little ragged. I'd used the entire wide strip on my left thumb nail and I was trying to be cheep I didn't want to open the second package. Instead I chose the next largest strip, which wasn't quite wide enough for my thumbnail on the end so I cut it down the center (which is where it is the widest) and shaped it to my cuticle with scissors. I then stuck it to my fingernail ready to stretch it around my thumbnail only to realize: I hadn't removed the clear plastic layer. I tried to catch the edge, tried cutting the edge, tried peeling it off entirely (and it got all stretched out in the center) and finally threw it away. 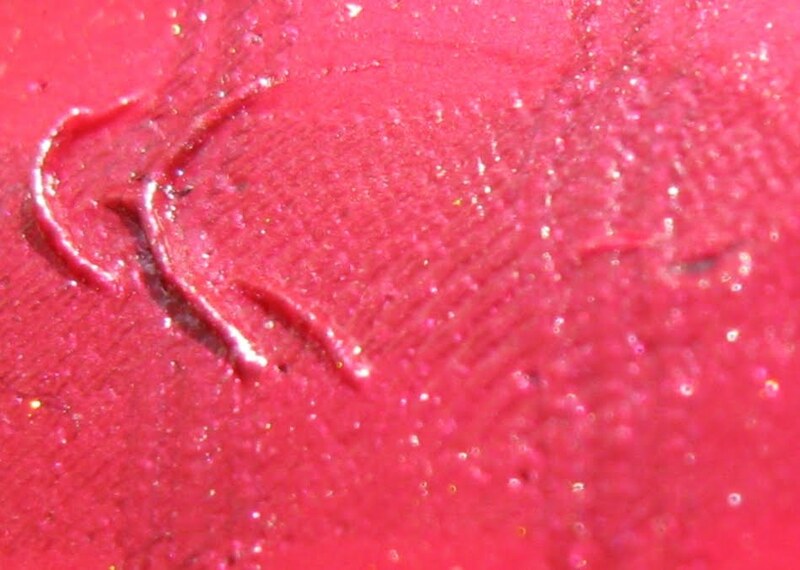 lesson #4: never forget to remove the clear plastic layer! 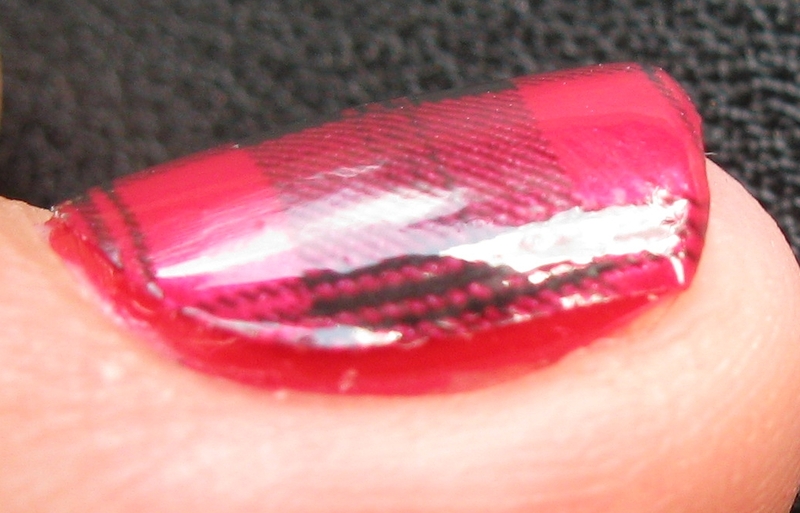 I then picked the next largest strip, removed the clear plastic, cut it and shaped it for my thumbnail. I stuck it down in the center and stretched it around both sides of the nail... and it tore down the center. Remember that really really narrow strip? I matched up the pattern and stuck it over the tear, worked perfectly for my thumbnail, but I managed to tear my left index finger too.. Overall, I love the look. It's really pretty and no one would notice all of my little mistakes unless they're a perfectionist like me. I've never purchased any sort of nail polish strips/wraps before so this is a first for me! I resisted because of the price and not seeing any patterns I really liked. I think first time users are a good honest "Can this idiot manage this?" review. Nail tips are weird... you can't really wrap your tips with the strips so there's wrinkles and uneven edges. That being said I'm definitely glad I finally broke down and bought these. They would be perfect for an accent nail. I actually really liked how my nails looked when I was half way through and had about half of my fingers polished red and the other half covered with the strips. I'd probably buy more strips if I had to travel and couldn't easily bring polish to coordinate with my outfits.